"Sweet-and-spicy, 3-bean, baked beans. Substitute cayenne pepper for all or some of the chili powder if you like it spicier." Heat a skillet over medium heat. Cook the bacon, ground beef, and onion in the skillet until the bacon and ground beef are completely browned, 7 to 10 minutes. Drain any excess fat, and transfer to a casserole dish. Stir the white sugar, brown sugar, ketchup, barbeque sauce, mustard, molasses, chili powder, and black pepper together in a bowl; pour over the bacon mixture. Add the kidney beans, butter beans, and pork and beans; mix thoroughly. Bake in the preheated oven until the liquid thickens, about 1 hour. Super easy!! I made it for after church in the crockpot and used Busch's baked homestyle beans! Minus the brown sugar, it was a huge hit! Will definitely make it again! Really good. Too hot - will cut back on pepper next time. But otherwise excellent. 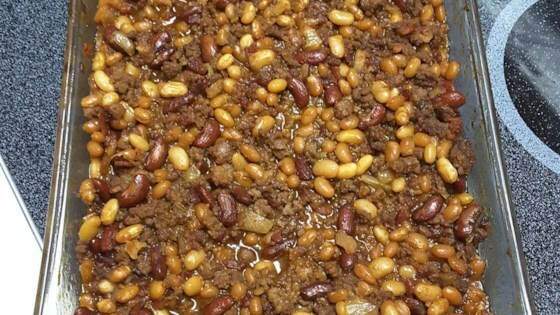 Most of my family doesn't like baked beans using more than one type of bean, but this was a hit and everyone loved it!! This was a hit yesterday for Father's Day. I doubled the recipe and cooked in the crock pot. Not a drop left for leftovers.